It’s not everyday that you find a class that offers both musical enrichment and political discourse. This semester, Emerson is providing its students with just that. Worldwide Underground: Hip Hop as Resistance Around the Globe is a new seminar class offered by the Institute for Liberal Arts and Interdisciplinary Studies this semester. Its curriculum covers everything from hip hop's roots in West Africa to its expansion and impact around the globe today. Assistant professor Cara Moyer-Duncan, who focuses on Africana studies, teaches the course. She said that, while several of her other classes touch on hip hop, none delve deep into the culture or broader meaning behind the genre. She credits student interest as a part of why she decided to create the course. “We live in challenging times … and we have to learn how to talk about some of these really difficult issues in new and more effective ways,” Moyer-Duncan said. First, the class sets up the historical roots of hip hop in West Africa and the Caribbean, and discusses early African American traditions. It later moves into hip hop’s main elements and aesthetics. Moyer-Duncan said beginning the class with this base knowledge helps illustrate that hip hop and rap music are rooted in culture and tradition. “What I want students to understand is that hip hop, it’s not just a musical genre … it’s a way of life,” Moyer-Duncan said. The course also covers social issues and themes, like how hip hop represents voices from marginalized groups in society, how hip hop deals with questions of gender and sexuality, and the implications of hip hop being embraced by the mainstream. “We will also talk about hip hop’s radical potential to be a cultural movement that can bring about social and political transformation,” Moyer-Duncan said. The class was created with a Curricular Innovation grant, awarded by the president’s office and the global engagement office at Emerson College. 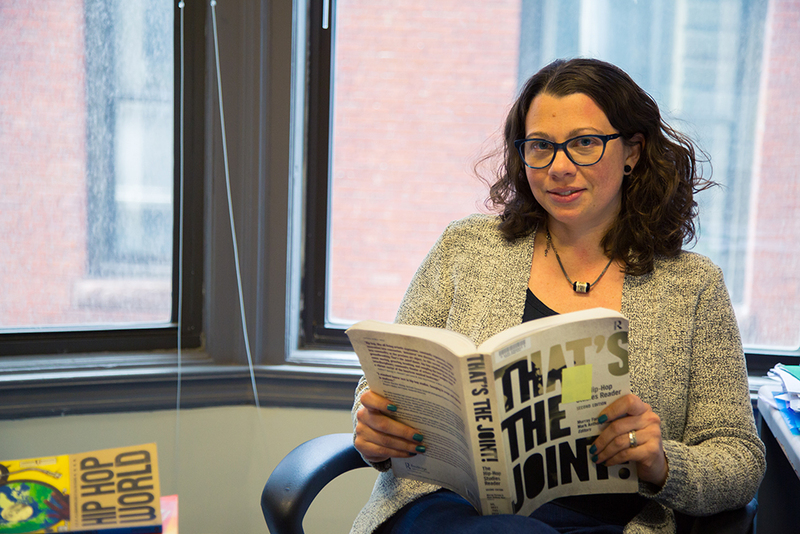 Amy Ansell, the dean of liberal arts, is involved in developing diversity perspective classes for students and expanding course options that connect to Emerson’s majors. As a political sociologist, Ansell said she has an acute appreciation for courses such as this. She said the topical curriculum enhances students’ perspectives in a relevant and interesting way. “It engages [with] current popular culture and ties that into race and culture and social justice issues,” Ansell said. Will Park, a senior visual and media arts major in the class, said that the class discussions have grabbed his attention. Park said hip hop and rap culture are more relevant than ever in today’s political and social climate. He cited A Tribe Called Quest’s recent, politically charged album, We got it from here...Thank you 4 your service, as an example of how artists use their voice to express their political and social opinions. “Rap as an art form, kind of like the origins of rap, have a lot to do with protesting the status quo,” Park said. Moyer-Duncan said drawing students in with a topic that they are enthusiastic about is a constructive way to get at some of the more complicated issues that face society as a whole today. “A lot of our students, they love hip hop music, but they don’t know its origins or they have never thought about it as social and political … and they wanted more,” Moyer-Duncan said.